Here are some fun pictures of the puppies whelped June 22, 1997. Sire: Am Ch Donahan's Morse Code Am CD (OFA Good, CERF), "Dash"; Dam: Ch Bondir's et Tessera Deliberer A/C CD, SHD, AgN, NAC, NJC, TT) OFA Good, CERF, Thyroid & von Willebrand Normal), "Libby". It's hard to believe, but the puppies are now 7 years old. They celebrated their first birthday June 22, 1998. We had parties with Brandy, Baxter, Riley & Minnie & heard from Betsy, Sara and Flash. Pictures of their 1st birthday celebrations can be found here!! You can also visit the puppies at 8 weeks of age at their Puppies Stacked page. Please click on a picture to see a larger view. Betsy enjoys life in Washington with her owners. Flash, pictured to the left @ 1 year of age, makes his home in Portland Oregon. Brandy is pictured to the left @ 1 year of age. She lives in Boulder Colorado. Minnie lives with us, (see more of her on her page & the Show Days page). She finished her Canadian Championship in 1999, her CD with class placements in August 2001 & her American CD in 3 straight trials in September 2002. She has her NAJ, 2 legs on her AgN, & 2 legs on her NA. Sara, a High in Trial winning dog, is pictured to the left @ 1 year of age & lives in Washington. She is pointed in Canada, has her American & Canadian CD, NA & Canine Good Citizen. She gave birth to 5 puppies on Sept. 12, 2001. Check out Sara's puppies. 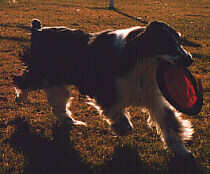 Riley is pictured to the left at 1 year of age enjoying Frisbee. 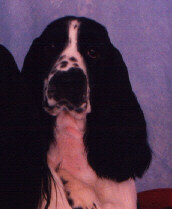 He makes his home in St. Albert Alberta & is having great fun in agility. 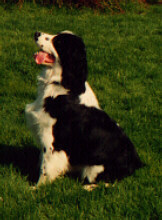 Copyright © 1997-2009 Lynn, Anne & Barb Dorsay, Bondir English Springer Spaniels. Last revised: October 05, 2009.